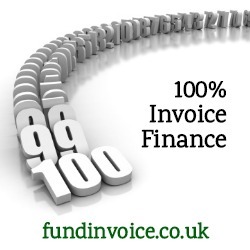 100% invoice finance funding levels are now available to a variety of industry sectors. One of our funding partners deals with funding car body repair invoices to insurance companies, and they fund those invoices at 100% less a flat fee percentage for using their service (the fee is just a few percentage points of the invoice value). The debt is bad debt protected, so there is no recourse to our client in the event of failure of the insurer. There are no debentures taken over the client company, and no personal guarantees. The directors only have to agree to fraud warranties i.e. unless they commit a fraud they are not liable to repay the prepayment. The process is so quick that the record we have achieved, between enquiry and payout, has been just 7 hours. The service is also fully selective, so the customer can choose the invoices they want to have funded, without any ongoing obligation to use the service again, or meet any minimum fees. We have regular discussions with our funding partners, to keep up to date with the latest developments, and during a recent conversation we pointed out that this was a very simple model that could benefit other sectors, beyond car body repairs. Our funding partner agreed that they would be prepared to offer the same service to our clients in other sectors, for example recruitment. Typically other sectors are funded at levels below 100%, so this could create a significant cash flow benefit to anyone with a restrictive prepayment percentage. The nature of this arrangement is very straightforward as you are effectively selling your receivables (at a cost of a few percentage points) to the funder, there is no waiting for your debtor to pay in order to access the remaining balance of the invoice value, as you will have received it up front. Product or service is being sold to a "blue chip" customer - this means a large well established company (with similar stature to an insurance company). A bullet proof paper trail - the means that the transaction is fully documented, with sign off from the customer. In the case of temporary recruitment this could be a signed timesheet. On that basis, the service can be offered to other industry sectors, beyond car crash repairs. Each case will be subject to the approval of our funding partner, who retain the right to decline a customer at their sole discretion. For a quote please call Sean on 03330 113622, or contact us about 100% invoice funding.